The ability to detect the spread of radioactive debris following a terrorist attack or nuclear accident is critical to saving lives and reducing economic damage. Aerial detection systems are an effective tool to survey contaminated areas in these situations. While significant technical improvements have been made to aerial detection systems over the years, historically it has been difficult to differentiate between airborne and ground-based radiation. This is a critical distinction when it comes to tracking the spread of contamination and assessing potential impacts to public health. To address this challenge, scientists at the Department of Energy’s Pacific Northwest National Laboratory have made improvements to an algorithm known as N-SCRAD, for Nuisance-rejection Spectral Comparison Ratios for Anomaly Detection. "N-SCRAD was always easy-to-use, and could detect very small levels of contamination,” says Mitchell Myjak, a member of the PNNL research team. “After recent developments, N-SCRAD can now distinguish between airborne and ground-based radiation, and can map how airborne plumes spread in a variety of weather conditions." To test the effectiveness of these methods, the PNNL team ventured to Gainesville, Fla., in early May to conduct a series of tests. 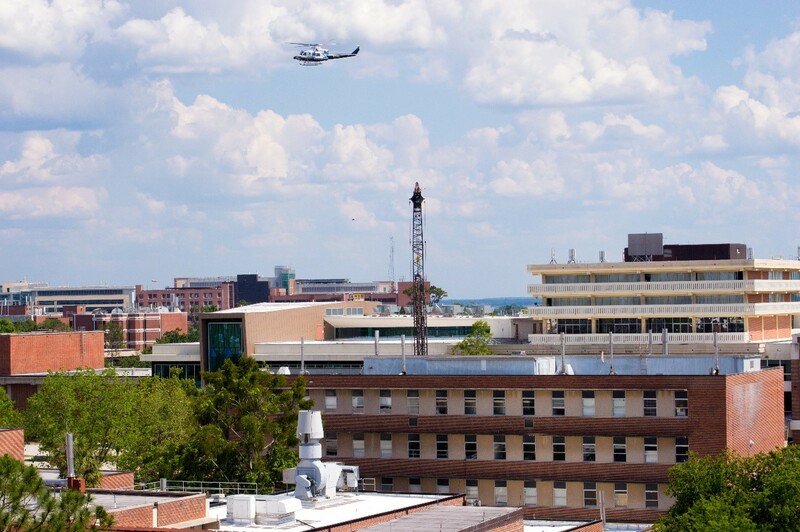 The tests involved flying a Bell-412 helicopter equipped with radiation sensing technology around the University of Florida Training Reactor. 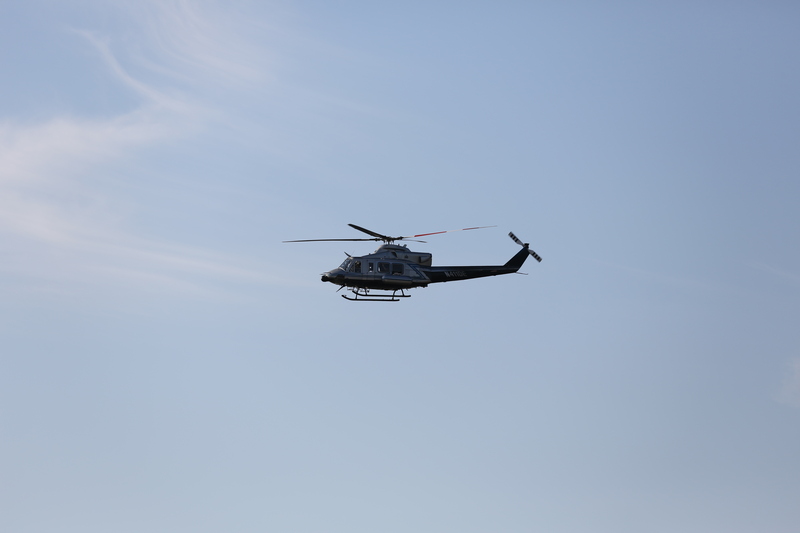 The helicopter is an asset of the Aerial Measuring System, owned by the DOE National Nuclear Security Administration and operated by the Remote Sensing Laboratory. As with many research reactors, the UFTR produces radiation during normal operations. Since the amount of radiation was far below the limits set by the Nuclear Regulatory Commission, detecting the radiation could have proved difficult. However, the advances to the N-SCRAD algorithm enabled even these trace amounts of radiation to be measured and characterized. This successful outcome indicates how the new methods can better protect the public during a real radiological emergency. "We were very happy with the initial results from the flight test, and demonstrated the ability to map the radiation at several altitudes and wind conditions,” says Rebecca Detwiler, a member of the team. “Although the radiation levels were very low, N-SCRAD could clearly distinguish the emissions from natural background radiation, as well as medical radioisotopes from the nearby hospital." The project team also included a trio of University of Florida staff including Associate Professor James Baciak, who is the director of the university's Nuclear Engineering Program. It also included Andreas Enqvist, an assistant professor of nuclear engineering, and graduate student Gabriel Sandler. "We are extremely proud to be part of this project, which is helping scientists and engineers test new algorithms and radiation detection equipment on very challenging measurements," said Baciak. "Including students on these types of projects is critical to ensure we develop the workforce necessary for national laboratories and federal agencies with missions responsible for national security, nuclear treaty verification, and emergency response." Now that the field tests are complete, researchers will use the results to fine-tune N-SCRAD for the response to a nuclear power plant accident or other radiological emergency. The research leading to the development of the algorithms and detection methodologies, as well as the field tests, was funded by DOE's National Nuclear Security Administration. The National Atmospheric Release Advisory Center, or NARAC, has provided plume models based on known area weather conditions.